Experience this enchanting capital considered a birthplace of Western civilization, a city filled with exquisite monuments, art, and cuisine. After your flight arrives in Athens, a private transfer will take you to your centrally located, brand new, 4 star hotel. After settling down you can lunch by the Acropolis before embarking on a privately guided tour. The Parthenon and Erechthion await, as well as an indescribable view of the city. 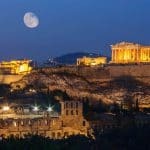 Here you can appreciate the architecture and history of classical Athens while standing among some of the greatest ruins of antiquity. After the Acropolis, you will visit the most exciting museum to open in Europe in the past decade. The New Acropolis Museum is filled with exquisite sculptures from the Acropolis. Return to the hotel, rest up and then get ready for dinner. Your evening meal will be at a classic restaurant in Plaka where you will enjoy Greek gourmet cuisine. After breakfast you will be met at your hotel by your private guide. 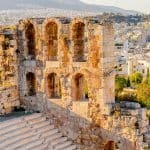 Visit the ancient Agora and then take a walking tour in the heart of the classical city, viewing Greek and Roman architecture and learning about the politics of ancient Athens. 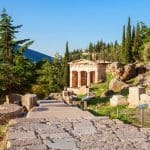 Highlights include the best preserved temple in Greece, the Temple of Hephaistion, and wonderful views up to the Acropolis. After the walking tour you will visit the National Archeological Museum, one of the greatest archeological museums in the world and a perfect spot to chart the history of Greek sculpture. You will also see the exquisite gold treasures from Mycenae and wall paintings from the island of Santorini c. 1500 BC. Lunch in Plaka and then return to your hotel to relax before your next adventure. Later in the day you will depart from the center of Athens and will be driven along the coastline to the Temple of Poseidon, around a 1 ½ hour trip with breathtaking scenery. As watching the sunset from the Temple of Poseidon is something that should not be missed, we suggest that you depart from Athens during the afternoon. On your way back after sunset you will have a lovely table by the sea will be reserved for you to enjoy dinner with the waves as your background music. In the morning at your convenience, you will have a private transfer from the hotel to the airport in time to meet your flight home or to jet off to your next Willing foot destination.